In 1839, the Reverend Benjamin T. Kavanaugh of Ohio was sent to the Dakota village of Kaposia … which was located where the Swift and Company plant stood until recently. Because of problems with Chief Little Crow of the Dakota tribe, he moved across the Mississippi River to establish a mission. 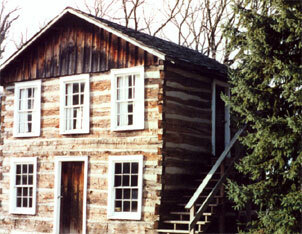 Between 1839 and 1840, he built this two-story log house in the forest at Red Rock. The upper level was used as the family residence, and the lower level was the meeting house and school. The logs for the house were cut from what is now Seventh Street and Jackson in Saint Paul, and floated down the river. While living in this log cabin at Red Rock, the Kavanaugh’s infant daughter died of diphtheria. Tragedy struck again when their son fell into the river and drowned … when he went to get a pail of water for his mother. Five days later, an Indian found the body near Red Wing and brought it back and helped bury it beside his sister. Reverend Kavanaugh served as a missionary to the Indians for four years, and then the mission was abandoned. In 1908, the log cabin was moved into the Red Rock Park Camp grounds in Newport. Many persons remember the log cabin which stood near the hotel during this era when so many people attended the Red Rock Camp meetings. While on the camp grounds, the log cabin had a porch around it … which made it look quite different than it does today. The second move of the log cabin took place about 100 years after it was originally built. In 1939, the Red Rock Camp was moved to a new location at Mission Farms on Medicine Lake … which is now in Plymouth (a western suburb of the Twin Cities). The log cabin (and the sacred Red Rock) were a part of the move when the camp relocated. 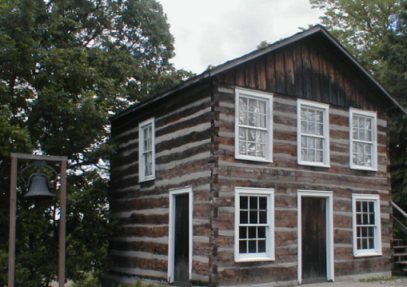 The third move of the log cabin occurred on July 12, 1969, when it was brought to its present location on the grounds of Newport United Methodist Church. It was taken apart for the move … the logs numbered, and then later reassembled. 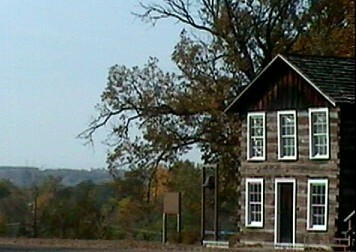 A historic marker was later placed beside the log cabin … marking it as the oldest Methodist building in the State of Minnesota. 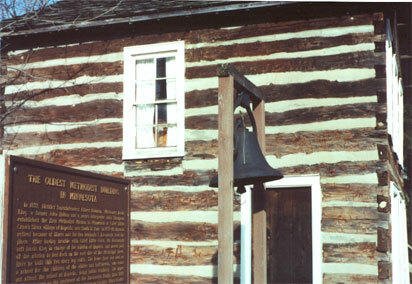 A special service was held on April 29, 1990, commemorating the 150th anniversary of the building of the log cabin. “There was a time, farther back than any man now living can remember, when the Great Spirit bethought him to come to the earth and live with his red children. For many moons he sought in vain for a place in which to abide. “At last, when he had almost become discouraged enough to give up – for even a Great Spirit sometimes becomes discouraged – he discovered a shady dell half circled by the ‘Father of Waters.’ Quiet and peaceful it was, lulled by the murmur of the majestic Mississippi and made pleasant with the songs of countless birds, but there was nothing there in which the Great Spirit could make his home. Far back in the hills he discovered a huge red boulder. “Square and stem it was, an angry red in color and streaked with vermillion, a fitting abode for a spirit. Entering the rock, the Great Spirit gave it temporary life and the rock rolled and bumped over saplings. Underbrush and lesser stones were left in its wake and a deep marked spoor that remained for years as a testimony that it once had lived. Coming at last to the dell, it rested on the bank of the great river. And the Great Spirit marked his totem on one of its faces and was content. Then came his red children to worship him. Generation after generation, they came. By lake and portage, by deep worn trail and by the smooth, Waters of the Mississippi they brought him rich gifts. Maple sugar, the choicest of the spoils of the chase,: pipes brought from the pipestone quarries of the Far West, wampum and kinnikinic, the fragrant Indian tobacco, were among the offering’s brought to provide for his comfort and to gain his favor. Often did the Indians bathe the rock in the blood of their enemies that the luster of the Great Spirit’s home might not grow dim. “Yet, when rival chieftains met on the sacred ground of Eyah Shaw, never did they forget to smoke the peace pipe and join together in their worship. And the Great Spirit was very happy. But in 1837 there came another God of the white man. “A Methodist missionary paddling up the Mississippi saw from his canoe the sacred ground. Landing there he trod boldly past the home of the outraged Eyah Shaw and erected within a short arrow flight a temple to the new God. From that time on the power of Eyah Shaw began to decline. Grimly he fought against the ever increasing influence of the new God. “Loyally, year after year, his faithful red children brought their gifts. Little Crow, one of the greatest of the Dakota (Sioux) chiefs, whose village was located at Kaposia, made a pilgrimage to Eyah Shaw before taking part in the Indian uprising at New Ulm and Hutchinson. But the white swarm became steadily greater and more bold. And the Indians were crowded more each year until at last they were segregated on reservations. Even then they remained faithful to Eyah Shaw, whole tribes of them making yearly pilgrimages to Red Rock. Then, in 1918, it all ended when the last pilgrimage was made by a tribe from Morton, Minnesota. The Methodist mission had grown to a large encampment with a tabernacle and numerous cottages. Followers of the white man’s God, who gathered at Red Rock each summer to worship for a period of about ten (10) weeks, moved the home of Eyah Shaw to their camping ground and placed it upon a concrete foundation, with totem facing the west. 1837 Rev. Alfred Brunson & the Rev. David King arrive at Fort Snelling and hold their first characteristically Methodist service for the soldiers at the U. S. Army at the fort. 1837-39 Brunson & King set up a mission at Kaposia to work among the tribe of Chief Little Crow. 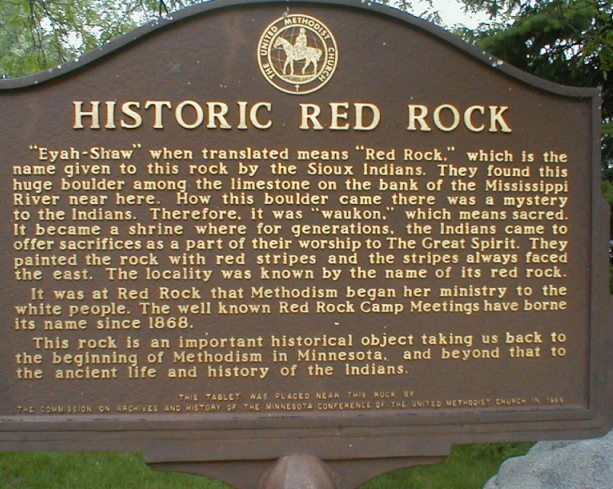 1839-43 First Protestant mission to white settlers established on East bank of Mississippi River at Red Rock, with Rev. Benjamin T. Kavanaugh of Ohio appointed to preside over this mission. 1850/1860’s Red Rock moved from its natural site to area west of RR tracks. 1858 First Minnesota Methodist Conference held. 10/1861 First official appointment made to Newport Circuit (Rev. Charles T. Barkaloo). Summer 1866 First Methodist church completed and occupied. July 1866 Methodists vote to offer the use of the new church to the Baptist Congregation who were without a building. 1868 Red Rock Camp Ground Association was incorporated & the first camp meeting was held in June 1868. Fall 1898 Church building destroyed by fire-Baptists come to the rescue & offer the use of their church building (now the Newport Public Library). 1889 St. Paul College (Methodist) buildings erected in St. Paul Park (closed in 1917). 1909 Log Cabin moved to Red Rock Camp grounds. 1926 St. Paul Park Methodist and Newport Methodist Churches merge. Late 1950’s Membership Skyrockets because of area growth and housing projects in Cottage Grove. 05/28/61 Church grounds for new church are dedicated at 1lth Ave. & Glen Road. 10/1961 Centennial of church founding is celebrated. 11/1962 First service in new building. 02/20/64 Red Rock moved from Medicine Lake to grounds in front of Newport Methodist Church. 11/1966 General Conference of Methodist Church & the Evangelical United Brethren Church vote to merge. 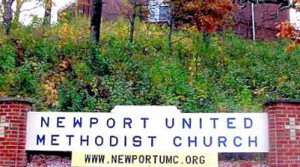 June 1968 Name changed to Newport United Methodist Church. Nov. 1968 Foundation for Log Cabin erected on church site. 07/12/69 Log Cabin dismantled, each piece marked, loaded on trucks & moved to Newport Church site. 1969/72 Re-construction of Log Cabin by members of congregation. Oct. 1971 Vincent K. Bailey dies, leaving a substantial gift to Newport UM Church. June 1980 Construction of new sanctuary and fireside room is begun. February 15, 1981 Consecration of new facilities. 1986 Year long celebration of the 125th anniversary of the church. 2001 140th Anniversary of the church. 2011 150th Anniversary of the church. 1997 – 2000 Kenneth L. Beale, Jr. Listing from History of NUMC, 1861-1974 and updated to the present. Copyright © 2019 Newport United Methodist Church.